Terrorism, demonstrations, natural disasters, are some examples of unforeseen circumstances. Crisis management to prepare for these contingencies, is an essential task for companies and corporations. 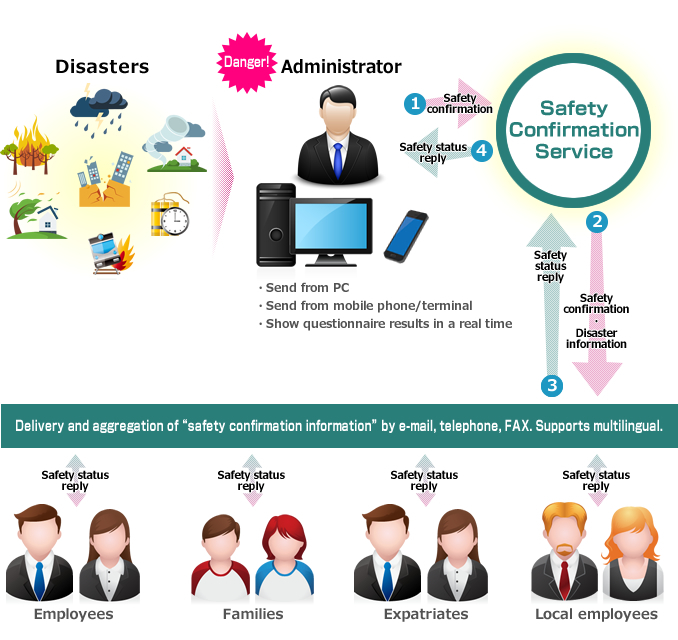 Arcadia “Safety Confirmation Service” helps you in confirming the safety of employees and their families, by using e-mail, telephone, or FAX. With a simple operation, you can quickly and reliably confirm their safety. Our service supports not only Japanese, but also English and some other languages. So, this service is usable even in foreign countries. The administrator can simultaneously deliver message by e-mail, telephone, or FAX, to the employees and their families, expatriates, and local employees, all at once. Messages that can be sent are not only in Japanese, but also in English or some other languages. Employees and their families who received the safety confirmation message, can respond and report their safety by e-mail or telephone call. Aggregate or accumulated results of the safety confirmation can be checked by the administrator using a WEB browser. 10,000 yen (tax not included). Up until 3,000 users (e-mail addresses). Cost will vary depending on the number of e-mail address.